One of the most beautiful thing about medieval religious artwork is that the artists were not constricted by moments of time. They had absolutely no qualms putting different moments into the same artwork so that the art, instead of displaying only one pivotal moment, stretched across time into a panorama displaying the gospel in a grandiose way. 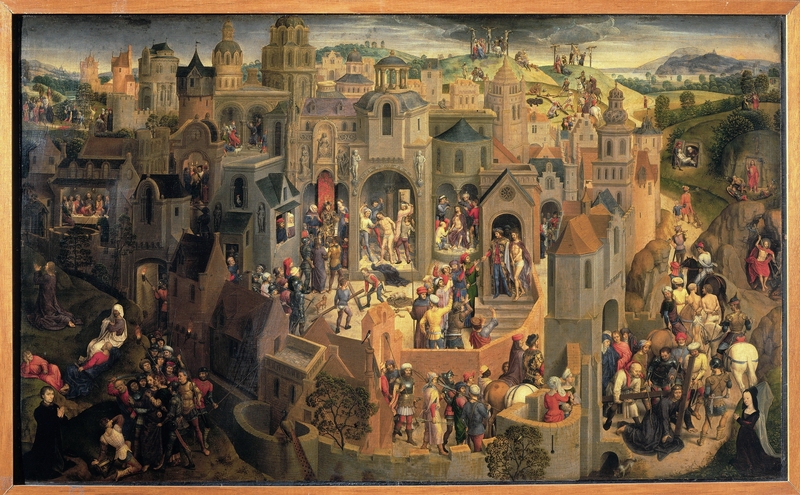 Scenes of the Passion, by Hans Memling, c. 1470-71. Galleria Sabauda, Turin, Italy. It’s a big piece of work, so don’t be afraid of clicking on it so you can zoom in further! There is just so much to see here! So, what are the little pieces in the artwork? Here are the ones that I spotted! I zoomed in on the details so you can see the little pieces more easily. If you see something else, feel free to comment… I might have missed something big! What can I say? There’s a lot to see here! What a magnificent artwork! It stretches across the whole Passion narrative, including the pivotal moments that preceded it, and reminds us that not only did Jesus die for us, but He also triumphed and won the battle against death for us. If that isn’t great, I don’t know what is! Thank You for Your Passion. May we always remember Your sacrifice so that we too may raise our crosses high and follow You.